underneath the dome of the sails and to glide over the sea! BLUECRUISE:ORG is a company settled in Bodrum for many years. Specialised in arranging boats for for personal needs and consulting. All facts given here for the recommend boats are based on own experience and knowing the owners. Please ask us for best offers, we will also take care of your personal wishes. 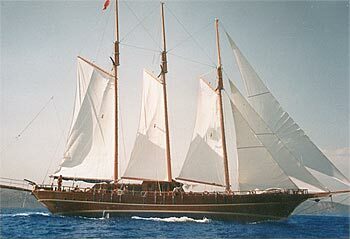 The schooner M/S TANYELI is a Gullet of the classical design, created by the Bodrum ship builders using traditional methods but also addind the best modern knowledge. You can see their inspiration in the basic design and in many fine -crafted details. Once on board the M/S TANYELI you will find yourself in an atmosphere of nostalgia which evokes the golden age of world-class sailing ships. with a sail area of 394 square meters. When all sails are set and the wind is singing in the rigging, you can hear rushing, gurgling noises under the bowsprit. The construction of the ship ensures that you will have a smooth and pleasant experience of sailing. What a magical feeling, to lie on the deck underneath the dome of the sails and to glide over the sea! Because the M/S TANYELI is so stable, even children feel quite safe and protected. The M/S TANYELI meets all the demands of its discerning clientele for a nostalgic and romantic cruise. At the same time it offers all the comforts you would expect to find on holiday. We have 9 comfortable cabins (for 18 guests) double beds or single beds. the cabins also have air-condition and heating systems. Your bath here is large and comfortable and the toilets work using the flush system, just like you are used to at home. You will experience the sun of the Aegean, the sea breezes and the proverbial hospitality of the people. The coasts of Turkey, with its deep inlets, wide gulfs and sheltered bays, and the nearby Greek islands, is a unique holiday region. The pleasant climate, crystal-clear water and the delightful, ever-changing scenery of the Eastern Mediterranean are waiting to welcome you. The schooner M/S TANYELI will visit magical harbours and coves and you will get to know the most popular bathing resorts and harbour cities. If you want, you can wander through famous archeological sites or use snorkeling equipment to discover sunken harbour moles. No sooner has the ship dropped anchor in one of the turquoise-coloured bays than the M/S TANYELI crew invites you to have a go at waterski, windsurfing or kayaking. You can snorkel to your heart's content! In the months which are not so warm, walks to ancient places or to nearby typical villages are the favourite pastime. The Captain of the schooner M/S TANYELI knows each harbour and every cove. The cruise will follow a fixed route which will be discussed with everyone on board. is considered to be among the finest in the world. On board the TANYELI you will find the finest Turkish dishes, prepared using the freshest vegetables, fish and meats. Our cook is an expert in his field. He will pamper you with three meals a day: breakfast, lunch and a three-course dinner in the evening. If you have any special dietary requirements (if there are certain foods you dislike or mustn't eat), simply let him know. He will be able to prepare it to suit your exact taste. Your meals on board: You may choose between Fullboard (3 meals + teatime) price € 30,- p/person per day . Soft Drinks and alcoholic drinks are extra, we can buy them at supermarket prices and you just pay us the bill plus a service-extra for the crew of only 10%. We think that's a fair offer and all previous guest did very much appreciate that. Meals are mainly served on deck under the awning which protects you from the sun. In cooler months, our guests dine in the deck salon. The bar in the salon is a favourite meeting point where you can socialize and enjoy an aperitif. There is nearly none of the gullet charter-companies who tells you the truth about the use of air-conditition on Gulets. Yes, M/S TANYELI has AC and you may think vou can switch it on when you like. Unfortunately it's not! On a boat the AC can run only when the generator is on, or in the harbor when connectet to 220 Volt. But mainly you are in anchorbays, often next to a neighbor, who doesn't like the noise of your generator and you wouldn't like it either during the night for example. So most of the gullets have come to an agreement not to disturb eachother - AC can be used on the most of the boats 2-3 hours in the morning or at night from 20 to 24 hours. And of course like all our boats, also the M/S TANYELI meets international safety regulations including life jackets, fire extinguishers and alarms.